22 cm li, 605 p.
"A Borzoi book." "A Borzoi book." 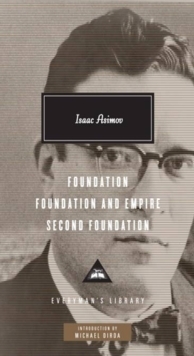 Foundation originally published: New York: Gnome; London: Doubleday, 1951 --Foundation and Empire originally published: New York: Gnome; London: Doubleday, 1952 -- Second Foundation originally published: New York: Gnome; London: Doubleday, 1953. Gathering together a band of courageous men and women, Seldon leads them to a hidden location at the edge of the galaxy where he hopes they can preserve human knowledge and wisdom against all who would destroy them. Asimov went on to add numerous sequels and prequels to the trilogy, building up what has become known as the Foundation series, but it is the original three books, first published in the Forties and Fifties, which remain the most powerful, imaginative and breathtaking.